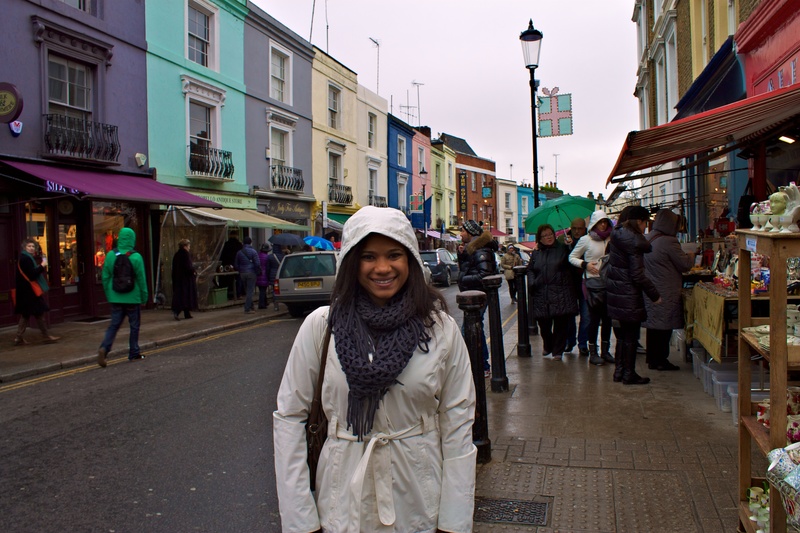 Visiting markets is always a fun way to mix in with locals and tourists alike. We tried to visit a few during our stay in London, but with so many other attractions on our list, we barely made a dent. Time Out London has information about many of the markets – check it out before your visit! The Borough Market is open for lunch Monday-Wednesday, but the market is in full force on Thursday-Saturday (we visited on a Thursday). We took the tube to the London Bridge station and walked around the area before entering the nearby market. Unfortunately we ate lunch before we got there – the sausage stall near one of the entrances of the market smelled delicious. Definitely plan on buying food from one of the many stalls and eating lunch there. The only negative is that there wasn’t much seating, but with something like a sausage, you can walk around while you eat. We did manage to save room for a blueberry tart – one of the dessert stalls was handing out samples and we needed more than that small taste. The majority of the stalls were occupied by food vendors. Aside from lunch and dessert foods, we saw cheeses, spices, meats, seafood, veggies, fruits, nuts, and more. Before we left, we were tempted by the caramel, cinnamon-apple smell of hot mulled cider. We each ordered the drink and we were surprised at how strong (alcoholic) it was. It was still good, especially after the initial sip, but the sweet smell threw us off. 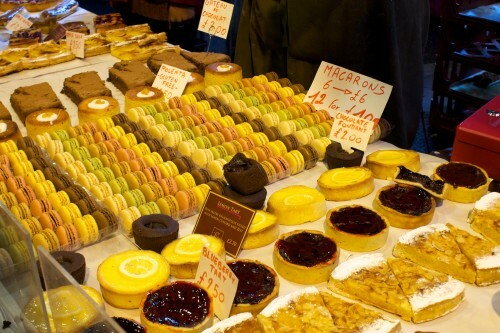 Do visit the Borough Market, do plan to eat lunch (and dessert) while you’re there, and do shop around and enjoy the stalls! You will not regret it. variety of goods. Unfortunately for us, it was raining all day Saturday, but we didn’t want to miss the excitement. We browsed through stalls and stores and managed to ignore the rain until the food stalls opened around 10am (we got there early to try to avoid the crowds, but it was still crowded). We tried a hodgepodge of food – greek appetizers, bruschetta, and a warm cheddar & leek quiche. The food was cheap and quick, and we quickly snacked while trying to stay dry. 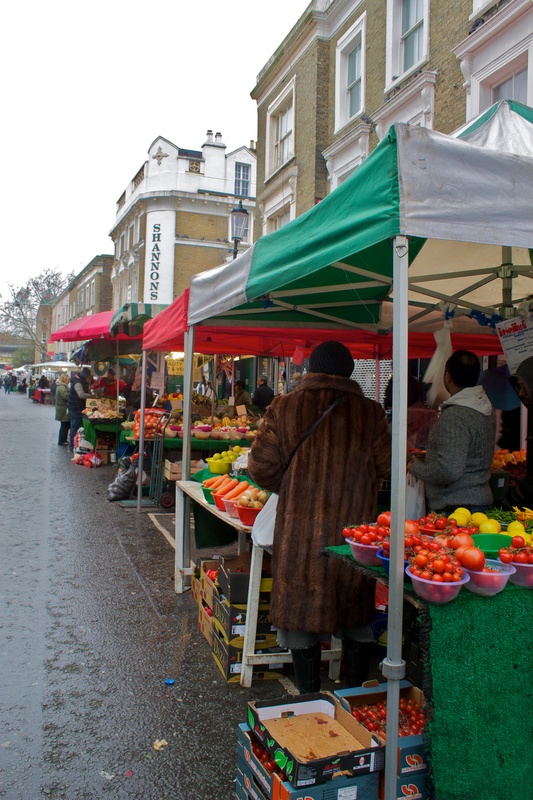 The Portobello Market is huge compared to Borough Market, so if you have time, plan to spend at least a few hours browsing the shops and stalls. Arrive early (to beat some of the crowds) and stay for an early lunch to get the most out of your visit. I wish we had been able to spend more time at both markets (and even better – if we had been able to use some of the fresh food to cook our own meal! ), but it’s something to look forward to on our next trip to London. Definitely plan a visit to at least one of the markets. It’s a great way to spend time between museums, enjoy a tasty snack, and maybe find a souvenir or two! This entry was posted in Food, Things To Do, Travel and tagged England, Europe, experience, London, London 2012 Trip, UK by Kristin. Bookmark the permalink.